« Like a Lotta Chocolate On Your Biscuit? The word guessing game of Hangman has been around for many, many years, and whilst it demands two players it can be played almost anywhere, so long as you have something to write with and something to write on. In case you don’t know the rules (surely unlikely) one player thinks of a word and draws a number of dashes to indicate how many letters it contains. The other player then tries to guess the word by shouting out letters. If the letter is part of the word it is written in place over the respective dashes. If it isn’t, lines are added to a picture of a man on the gallows, which if completed signifies the end of the game, and the person who thought of the word is the winner. Obviously if the other player guesses the word before the hangman image is completed then they win. Given such a simple concept, you have to wonder what the point was of turning it into a boardgame when a pencil and paper do just as well, if not better. The boardgame version consisted of two hinged plastic playing boards, a bit like the Battleships boardgame, another game to come originally from a pen and paper original, although at least with Battleships you had little model ships that made it feel more like you were a Naval Commander. 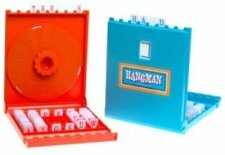 Each of the Hangman boards contained a lot of little plastic tiles with letters on, which when the board was opened up could be slot into little holes in the top. The major change to the rules with the boardgame was that both players could think of a word at the same time. They slotted the little letters into the top of their board, facing towards themselves, and took turns to guess letters. If a letter was present that tile was turned around so the guessing player could see it. If not a dial in the centre of the vertical part of the board was twisted to turn a dial showing the various stages of the hangman gallows. Ultimately I always felt Hangman as a boardgame was a bit of a waste of time. You were limited to having words no longer than the number of slots in the top of the board, which meant long words or phrases like those used on TV Game show Wheel of Fortune couldn’t be used. 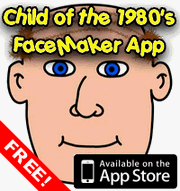 You also missed out on being able to embellish your drawing of the little man on the gallows by adding hats or unsmiley faces to the poor little chap. This entry is filed under Toys - Boardgames	and was posted on July 14th, 2008. You can follow any responses to this entry through the RSS 2.0 feed. You can leave a response, or trackback from your own site.